Contain the slime before it's too late! Explore a castle overrun with monsters. No, the other LOVE entries seem to be giving me text/font trouble as well. I can run the LOVE executable by itself and get the "NO GAME" message, which I presume is using fonts, but it doesn't work with actual games. I just tried a Visual Novel(ette) that I wrote with Lua a while back. It's using completely bog standard fonts, but it's not showing any text with LOVE 11.2 either. LOVE 10.2 works fine, font-wise, but won't run any of your cool modern games. : ( So this is definitely the fault of my setup. I will try to either fix or get another computer so I can test things properly before the deadline. The common factor may be LOVE... I should try to put together something simple that just displays text. Maybe that will pinpoint it. I have had text/font problems with another LOVE-based entry, so that seems to be the common factor. I don't know why it is having the problem -- my LOVE projects work OK... Maybe something about my machine. Will try on another one if I get a chance. Thanks for suggesting the workaround! I tried both. Thanks for looking. I can see the white lines that appear around the menu entries, and move those around, but the text is either missing or the same colour as the background. Right, that's how I see it. A "secret ingredient" keeps a contest fairer so that contestants can't prepare "too much" ahead of time. But there's a difference between throwing some asparagus on top at the end or making it integral to the dish, and a category for that could recognize that. It's probably a bit late for this now, but maybe for future Jams with a "secret ingredient" -- one of the ratings should be how well the submission expressed the secret ingredient. That was one of the judging categories of the old Japanese "Iron Chef" TV show and it would work well for this situation too. Note: Windows version may be missing a font file -- none of the text shows up. Nice treatments on the backgrounds! Collision map is also interesting technique. Very atmospheric! Some hints on the objectives would be nice. Note music didn't play on Win 7. Thanks! Breakout section kept resetting bricks on lost ball so I wasn't able to get past that. Note long start up time on Windows 7 for whatever reason. Dynamic camera and ship physics are nice! Also like the particle system and stars. Hi! Just so you know, game seems stuck in a loop for me -- large window blinks and disappears, then replaced with smaller window with the maze pictured on your big screen shot. 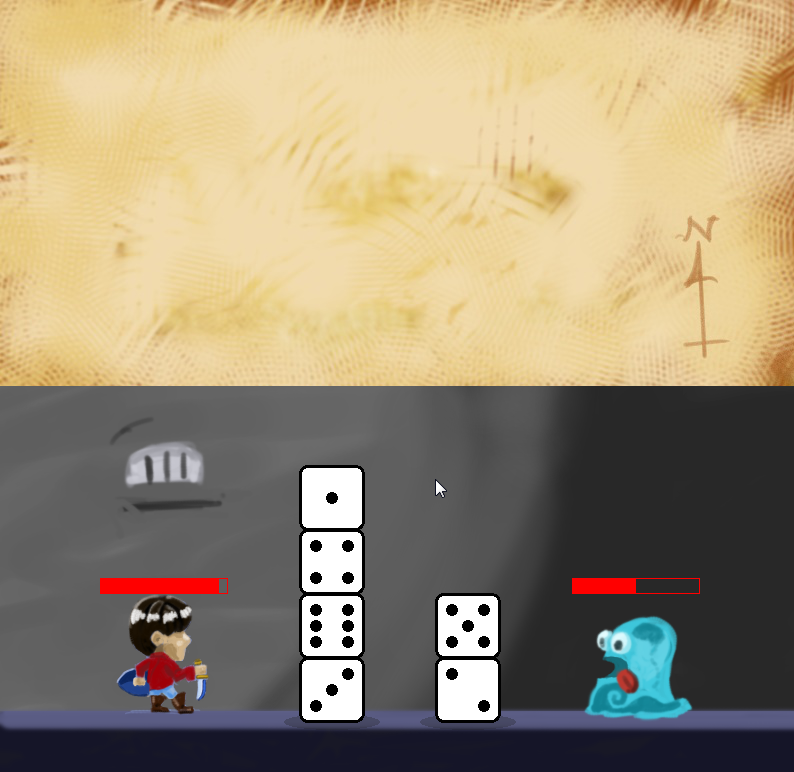 No menu though and slime creature just jumps around and around in the lower left hand corner by himself. Doesn't seem to accept my key presses. Windows 7, LOVE2D 11.1 64bit. Autumn Lisp Game Jam 2018 community · Replied to samdphillips in Racket? Good luck! Nice avatar, BTW! Autumn Lisp Game Jam 2018 community · Created a new topic Racket? Anyone using Racket? Just asking! Hi! Thanks for giving it a try! Happy you liked it! No problem! This is just feedback so you're aware that this particular configuration had a problem. Unless you have an EA budget, it's hard to test across every architecture! Thanks for taking the time to look into it! Hi! As far as I know, you should be able to... Download the castle_src_20180429_2310.zip package and see if it works for you. (Use %castle.rkt from the %src/ directory). That is the version that I compiled my submission from, so if they're not kidding about the cross platform-ability, you should be set. There are no dependencies outside of Dr. Racket. OpenGL signalled (1282 . INVALID-OPERATION) from TEX-STORAGE-2D. changed too much to cope with. I had a similar error with another game in this Jam, so they may be related. Thanks! So... It seems your packager isn't including needed stuffs! Hi! Just downloaded what I think is your fixed Windows build (has libffi-6.dll). However fails immediately to start. Not even an error message when I try to run from console. Using Win7, 64bit. Thanks! Hi! Using Win, 64 bit. Game started OK, and Frog sock puppet introduced himself, but after that, I was stuck behind a big brown rectangle that filled most of the screen. Wasn't able to walk the character into view. Nice that you have 3D models and environment. Hi! Using win32 package. Title comes up, but menu ("NEW GAME", "HOW TO PLAY", etc.) doesn't. After some time title goes away, leaving just background. Possible that a dependency was left out of the Windows package? Using Win7, 64bit. Thanks! Win7, 64bit. Hope that helps! Took a quick look at assets -- nice bg for the playfield! Hi! Just played the music and showed the nice scrolling background for me. No title or character interaction. Win7, 64. Hi! Glad you liked it! I ran out of time, but I hope to update it with more content after the Game Jam rating period ends. Thanks! Better map treatment, nicer dungeon walls. 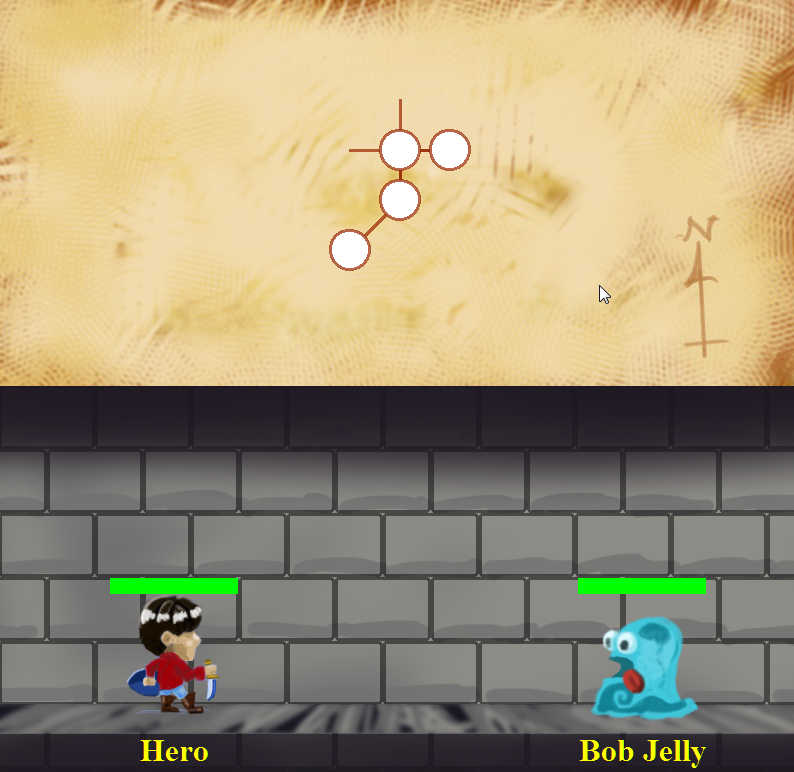 Now has animation system, with actual animations for idle and attack (so far). Using a simple per-mob state-machine and counter to handle that. 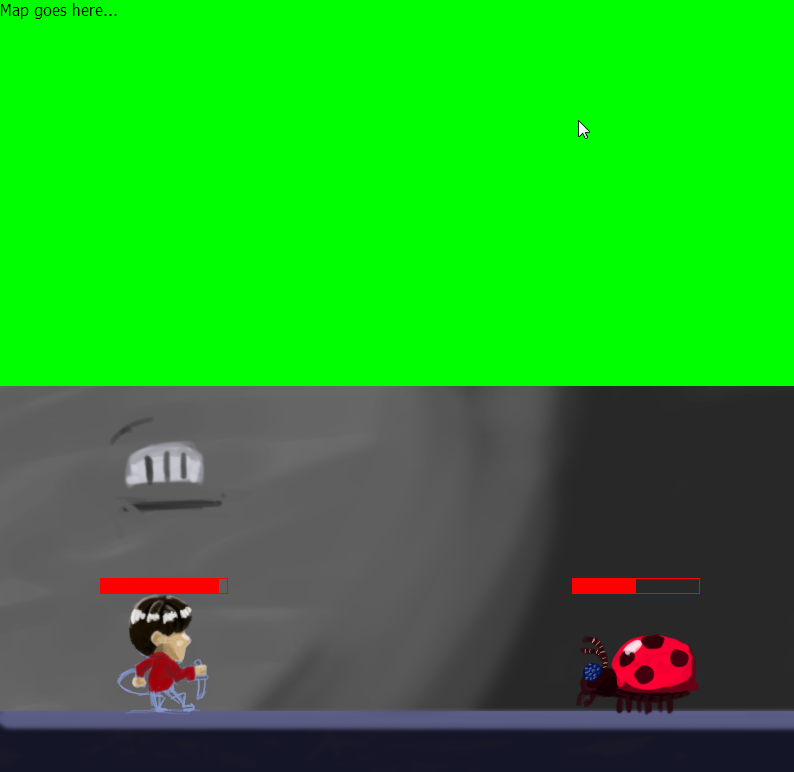 Got keyboard event handling going, first stab at the arena combat state machine and coloured health bars. So, update on Castle Monsterous... Filling out graphics and adding a different monster type. mob-hero-brunette is now fully dressed. Using Racket out of the box. This is... going to be a strange game.